At our recent Mathcounts club meeting I decided to practice some permutations and combinations problems with the Mathletes. We were able to get most of the answers after some discussion; but the predominant feeling, I think, was that permutations and combinations involve a good deal of “black magic”—that is, we can get the answer, but we don’t always know when to multiply, divide, or factorial. That’s why I decided I need to write out the steps so that all our Mathletes can refer back to this as a guide for solving permutations and combinations problems. There’s something you should know, though, before you start reading this expecting a foolproof method that works for every situation. These problems will require you to think, analyze, and check your work. You can’t expect to get these right if you want a formula for them. Instead, each one will ask you to use the formulas you know in new ways that you may never have thought of. And that’s one of the great things about Mathcounts: even during a competition you can still be learning. But for now, I’ll walk you through the basic steps for how to solve a permutations and combinations problem. In this post, I’ll assume that you know how to calculate factorials and that you know what combinations and permutations are, and especially the difference between them. Are you in a hurry? If you need to read this really quick before a competition, or you think you know most of it already (which I don’t always recommend, by the way), you at least need to look at the bold and italic headings down the page. If you have some more time, work the example problems! They are very important in understanding this material. If you just need a general practice, the problems for you are at the bottom. Step 1. Determine what kind of problem it is. Is it related to permutations? If it is a permutations problem, it will often contain words like “arranged,” “in a row,” or “in order.” Basically, if we’re keeping a tally of how many ways we’ve found, ABC would get a tally mark and ACB would also get one. Example. In how many ways can eight books be arranged on a shelf? Is it related to combinations? If it is a combinations problem, it will generally not contain the words mentioned above. Instead, these problems have to do with groups of things in ways that the order doesn’t matter. If we keep a tally, ABC, ACB, BCA, BAC, CBA, and CAB would collectively receive one tally. Example. In how many ways can three books be chosen out of eight? Do I need multiple cases? Remember that permutations and combinations are limited to “x choosing y” type problems. If you need more than one of these choosings (let’s call them “cases”), you need to plan for them. If the problem asks you to combine those cases together to make a single tally, you need to multiply the results of each case. If each case makes tally marks separate from the others, you need to add the results of each case. Example. How many integers less than 100 can be formed using the digits 1, 2, 3, and 4, with each digit used only once? Solution. There are two cases: one-digit numbers and two-digit numbers. For one-digit numbers, there are P(4, 1) = 4 possibilities. For two-digit numbers, there are P(4, 2) = 12 possibilities. Since each case makes tally marks individually, there are 4 + 12 = 16 integers total. Example. How many ways can ten books be arranged on a shelf if the first five must be nonfiction and the last five are fiction? Solution. There are two cases: the arrangement of the nonfiction books and that of the fiction books. For the nonfiction books, there are P(5, 5) = 120 possibilities. The same goes for the 5 fiction books. Since the two cases must be combined to produce a single tally mark, 120 x 120 = 14400 possible arrangements. Note that both of the above problems involved permutations. That’s because combinations require other calculations, which we’ll go into below. Are there repeated elements in the set I have to choose from? If there are multiple items that would be indistinguishable in a solution, you have two possible things to do. If it is a permutations problem, keep it in mind until step 3, when we’ll talk about it in more depth. If it is a combinations problem, you will need to make multiple cases. Make one case where all elements are the same, one where all except one are the same, one where all except two are the same, and so on until none are the same. And watch out for cases that are the same, for example: “one the same, two different” and “all three different.” Confused? Check out this example. Example. A box contains three red balls, two green balls, and one blue ball. In how many ways can two balls be chosen? Solution. This is a combinations problem, because the order of the balls doesn’t matter. There are repeated elements, so we need to make multiple cases. Case 1 represents how many ways we can pick so that both balls have the same color (2 ways). Case 2 represents how many ways both balls will have different colors (3 ways). Since the cases don’t combine to make one tally mark, we add the two cases together to get 5 possible ways. So now we’ve figured out what kinds of calculations we need to do! Give yourself a pat on the back and keep reading. Step 2. Calculate the permutations. For this step, I suggest that you use the “blanks” method, which is fairly versatile. It’s important that you understand how the method works, because you can modify it to model probability and combinations problems (even though the basic method calculates permutations). There are plenty of problems on this blog whose solutions involve the blanks method; please look in the “Probability” category for practice. To calculate permutations using the blanks method, first figure out how many items you are choosing. This is the number of blanks you will use. Then for each blank, figure out how many things you have to choose from (whether some are identical or not) and write it in the blank. Finally, multiply the numbers in the blanks. Solution. This problem uses permutations, as indicated by the word “arranged.” There is only one case because each possible arrangement of all eight books is a single tally mark. Using the blanks method, we have eight blanks and eight things to choose from: 8 x 7 x 6 x 5 x 4 x 3 x 2 x 1 = 8! = 40,320 arrangements. Example. How many 3-digit area codes are possible if the first digit cannot be zero? Solution. This problem uses permutations, as the order of the numbers matters in an area code. There is only one case. Also, digits can be repeated. The first digit can be nine possible values, while the other two can have ten: 9 x 10 x 10 = 900 area codes. Again, these problems only involved permutations. The extra steps for combinations will be discussed below, in step 3. The blanks method goes above and beyond the permutations formula, though. Why? Because the blanks method allows for constraints like the “first digit cannot be zero” above. Also, you can use it for probability; the numerator of the probability would be the number of permutations that satisfy the condition, and the denominator would be the total number of permutations possible. Example. Given that area codes are three digits and the first digit cannot be zero, what is the probability that an area code will be an even number? Solution. This problem uses permutations because the order of the number matters. We will consider the number of permutations that satisfy the condition (even) and the total number possible separately. For the first set of permutations, we have three blanks for three digits. Nine values (1-9) can go in the first blank, ten (0-9) in the second blank, and five (0, 2, 4, 6, 8) in the third. 9 x 10 x 5 = 450. The total number of possible values was found above to be 900, so 450/900 = 1/2. That wasn’t hard, was it? Of course, you probably could have found the answer just by thinking about it. But in competition you will get a problem that you can’t model intuitively, and that’s when you’d need this method. Still with me? Then keep reading, as we’re almost finished! Step 3. Modify the results so that they make sense. This is probably the hardest part of solving permutations and combinations problems (but don’t give up!). Now that you have a number of permutations, you need to transform it into an answer. To do this, we need to take each case separately and verbalize what that case represents, and what answer you have from the number of permutations. Usually, if the problem isn’t asking for straightforward permutations (as in the above examples), you will need to divide by something to eliminate “tallies” that count the same thing twice. For example, if each answer is counted twice, you will need to divide by two. Does the case represent combinations? If the solutions for the case in question are the same if they are rearranged, you will need to divide the number of permutations by the factorial of the length of each solution. For example, if each solution consists of three elements (like ABC), we would divide by 3! = 6. This makes sense because ACB, BAC, BCA, CAB, CBA are all counted in addition to ABC, and we want to get rid of them. Example. In how many ways can a set of five books be chosen if the first two are to be chosen from a pile of three nonfiction books, and the other three are to be chosen from a pile of five fiction books? Solution. This problem will require combinations, as the order of the books does not matter. There are two cases: one concerning the first two books, and one concerning the other three. For the first case, the blanks method gives 3 x 2 = 6; for the second, the blanks method gives 5 x 4 x 3 = 60. Now we need to take each case separately and make sure it represents the right value. For the first case, we need to divide by 2 because we’re asked for combinations and there were two blanks: there are 6/2 = 3 combinations. For the second case, we need to divide by 3! = 6 because there were three blanks, giving 60/6 = 10 combinations. We then need to multiply 3 and 10 because those two cases combine to make one tally mark (see step 1 for more about this), giving an answer of 30 possible ways. Additional note. So as I was solving this example problem, a question occurred to me: do we need to divide anything at the end, after we combine the two cases? The answer to the question is no. To explain why, let’s say the three nonfiction books are labeled A, B, and C, and the five fiction books V, W, X, Y, Z. A solution that earns a tally mark might look like ACVWX, BCVWX, or ACWXZ, to name a few. We don’t have to eliminate any more permutations because we have not made tallies for the permutations that mix the two types of books up, like WVAXC. You’ll need to be thinking about nuances like this as you solve problems, because a single slip-up can change your answer by hundreds or thousands! If it’s a permutations problem, are there repeated elements in the set to choose from? Back in step 1, I told you to stick around until we got here to take care of the repeats in a permutation problem. Well, here we are! Luckily, it’s easier than dealing with repeats in a combinations problem. All you have to do is divide the number of permutations by the factorial of the number of repeats. For instance, if there were four A’s in the set, you would divide by 4! = 24. You divide for each different element that is repeated. Study the example to see this in action. Example. How many permutations of four letters can be made from the word MISSPELLED? Solution. There is only one case, as we are directly asked for a number of permutations. Using the blanks method, we have 10 things to choose from and 4 blanks: 10 x 9 x 8 x 7. Since I don’t have a calculator, let’s go on to step 3 and see if we can divide some things out. There are 2 S’s, 2 E’s, and 2 L’s in the word, which means we need to divide by 2 three times. . So the answer is 630, providing the word isn’t misspelled… wait, what? Step 4. Check your work and verify that the answer makes sense. Finally, you have an answer. Take a deep breath and enjoy the victory of having conquered a tough math problem. But before you move on, double check to make sure your answer is logical. Make a few sample solutions to see if they really satisfy the conditions in the problem. Most importantly, make sure you haven’t left out any solutions, because these errors are the hardest to catch. I won’t give you any examples for this specifically, but I hope you’ll take my advice and check your work on the problems at the end of this post. Mrs. Anderson has to choose a group of two boys and two girls to represent her class. If there are six boys and eight girls in the class, how many groups are possible? In the imaginary country of Mathematica, a ZIP code is five digits long. The first digit must be a prime number, the third digit must not be 0, and the last digit must be even or zero. How many ZIP codes are possible for this country? How many even positive integers can be made using the digits 1, 2, and 4, using each digit only once? There are 7 red marbles, 2 blue marbles, and 1 green marble in a jar. In how many ways can three marbles be selected from the jar, if two marbles of the same color are identical? Answers. To check your answers for these problems, decode the letters using the alphabet code A=0, B=1, etc. If you didn’t get all those problems right, then you need to check out the other problems on this website. But the most important thing is to treat these problems like a good challenge. Each problem asks you to think, even if it boils down to counting on your fingers. So have fun! Last time, we discussed the Greatest Common Denominator function. Now, I turn to its counterpart, the LCM. What does the LCM function mean, and how can we calculate it? The LCM function, written as lcm(a, b), finds the lowest possible number into which both a and b will divide evenly. For example, the LCM of 6 and 8 is 24 because 24 is the smallest number that is divisible by 6 and 8. Find the least common multiple of the following pairs of numbers: 3 and 6, 9 and 12, 4 and 5. Notice that in the last example above, we arrive at a special case when a and b are relatively prime; that is, there is no number that divides evenly into both a and b except 1. In this case, the LCM turns out to be the product of the two numbers. In the last post, I gave the example of tiling a rectangular floor with square tiles to illustrate the Greatest Common Denominator. In accordance with the reciprocity of these two functions, I will now present a similar yet opposite scenario. As you may have guessed, our contrary proposition for the lowest common multiple function, in contrast to tiling a rectangular floor with square tiles, is tiling a square floor with rectangular tiles. The task is to find the smallest possible square room into which our ornate rectangular tile will fit EXACTLY. Find the smallest room that can be tiled evenly with the following sizes of tiles: 6 by 9, 2 by 4, 8 by 10. In the Greatest Common Denominator post, we discussed using prime factorization to find the GCF of two numbers. Continuing our contrast, we can use a similar yet opposite method to find the LCM of two numbers. Consider the example lcm(20, 22). The prime factorization of 20 (which you can find using a factor tree) is . The prime factorization of 22 is . In the Greatest Common Denominator post, we took each factor with the lowest power, and omitted it if it wasn’t in both a and b. For the LCM, we’ll take each factor with the highest power, and we’ll keep it even if it isn’t in both numbers. For instance, we’ll take 5, 2 squared because its power is higher than just 2, and 11. Multiplying our new list of factors, we get an LCM of 220. For the second method, let’s look at a close opposite to the floor tiling method we examined in the GCF post. Then, we subtracted square regions until all that was left was a square region. Now, we add rectangular regions until we have a square region. For instance, given lcm(16, 20), 16 is less so we add 16 to itself. Then between 32 and 20, we add 20 to itself because 20 is less than 32. We then have 32 and 40, 48 and 40, 48 and 60, and 60 and 60. The numbers are now equal, so 60 is the LCM. The LCM is used in situations where, like Mr. Baxter’s predicament, we need to find where two dimensions become equal. For instance, one would use lcm(15, 20) to find out the time between two trains meeting in a station. In mathematics, the LCM is crucial to adding and subtracting fractions. For instance, the denominator of 1/6 + 1/8 is lcm(6, 8). Try these problems using LCM. Remember that the LCM of three numbers a, b, and c is simply lcm(lcm(a, b), c). 1. Two trains leave a station at 12:00 noon. The A train visits the station every 25 minutes, and the B train visits the station every 15 minutes. At what time will the two trains meet in the station again for the first time? 2. What is the smallest integer that is a multiple of 14, 9, and 21? I hope this article helped you understand the lowest common multiple function. Please leave a comment if you have any questions! Two of the most basic functions in number theory are the LCM (least common multiple) and GCD/GCF (greatest common denominator/factor) functions. They are opposites of each other, but not in the same way as addition and subtraction, multiplication and division, etc. What do these functions actually mean, and how can we use repetitive methods to evaluate expressions using LCM and GCD? First let’s look at the Greatest Common Denominator function. Written as gcd(a, b), the GCD function determines the largest number by which a and b are both divisible. For instance, the GCD of 6 and 8 is 2 because 3, 4, 5, and 6 cannot be divided evenly into both 6 and 8. Evaluate the GCD of the following pairs of numbers: 3 and 6, 15 and 20, 8 and 20, 3 and 5. As evidenced by the last problem above, a special case occurs when the two numbers are relatively prime. In familiar terms, this means there are no numbers that can be divided into both a and b except 1. For instance, 7 and 12 are relatively prime and so their GCD is 1. Mr. and Mrs. Allman, proud new homeowners, are in the rare position to choose the decor on the house they will inhabit for years to come. They roam the barren rooms with the stolid contractor Mr. Baxter, animatedly conjecturing about the new Jacuzzi, the new modern skylights, etc. But for now, Mr. Baxter brings their attention to a more mundane issue: the kitchen flooring. Mr. Allman, who happens to teach mathematics at a nearby high school, speaks up. “We could use the greatest common factor function—” Mrs. Allman gently cuts him off. Mathematics has no place in the kitchen. No, no, let Mr. Allman speak. The GCD of 24 feet by 30 feet would in fact give Mr. Baxter the size of the largest square tile that fits (or divides) evenly into the room dimensions. A little computation tells us that the GCD returns a value of 6 feet. Find the largest square tile that will fit into a room with these dimensions: 9′ x 12′, 25′ x 24′, 18′ x 30′. So far, the only way we’ve considered is by guessing and checking—I think 2 is the GCD; no, wait, 4 is also a factor, so is 6. But what about when we hit numbers with many factors, such as gcd(420, 440)? Note: Many will find it terrifying that I use the word “algorithm” in the following paragraphs. Please do not fear! An algorithm is simply a series of steps that can be repeated until you get the answer. The below methods are really not that complicated, and I’ve tried to explain them as best I can using that limited medium we call English. The trick to finding the GCD is for each prime number we see, putting the term with the smaller power into the answer. If a prime factor isn’t in both numbers, we can’t accept it because there’s no way it will divide evenly into both numbers. For instance, we’ll take 2 squared and reject 2 cubed. We won’t take 3 because it’s not in 440’s factorization. We’ll also take 5, but not 7 or 11. Multiplying all these factors together, we get a final GCD of 20. 2. The second algorithm is a classic one used frequently by computers, but it can help you, too. Given gcd(240, 440), first determine the larger number—obviously 440. Now subtract the smaller number, 240, from this: 200. Then repeat given the difference and the smaller number: gcd(200, 240). We then arrive at gcd(40, 200), then gcd(160, 40), then gcd(120, 40), gcd(80, 40), gcd(40,40). Stop! We can’t go any further. The GCD of 240 and 440 is irrevocably 40. In symbols, this method can be expressed much more simply. Given that a is a smaller number than b, we can declare that gcd(a, b) = gcd(b – a, a). When a = b, we have our GCD. How can we explain this method’s captivating simplicity and consistency? To do this we need to return to Mr. and Mrs. Allman, standing in the floorless kitchen, the sound of Mr. Baxter’s boots echoing on the concrete as he searches for 6-foot tiles. “Whatever you say, sweetie,” says Mrs. Allman dreamily. “Yes, well.” Mr. Allman clears his throat and straightens his glasses. “If a square tile can fit into the a square space, we can remove a square space from the room and focus our attention on the remaining part: only 24 feet by 6 feet. Then we can remove another square space, and another, and another, and all we have left is a 6 by 6 square. And there’s the answer!” Mr. Allman seems to stand up straighter at that moment, as though the answer itself has reinforced his posture. Returning to the pristine world of mathematics, Mr. Allman has showed that the GCD can be found by removing square sections of a rectangle. The final square section remaining is the long-awaited answer. Practice using both methods described above by calculating gcd(261, 378) and gcd(144, 162). In the next post, we’ll discuss the lowest common multiple and its similarity to the GCD. If you have any questions, please leave a comment below. Try the Scatter game on the Quizlet website to shake things up a bit. Remember, this information is a must-know on any competition. Have fun! 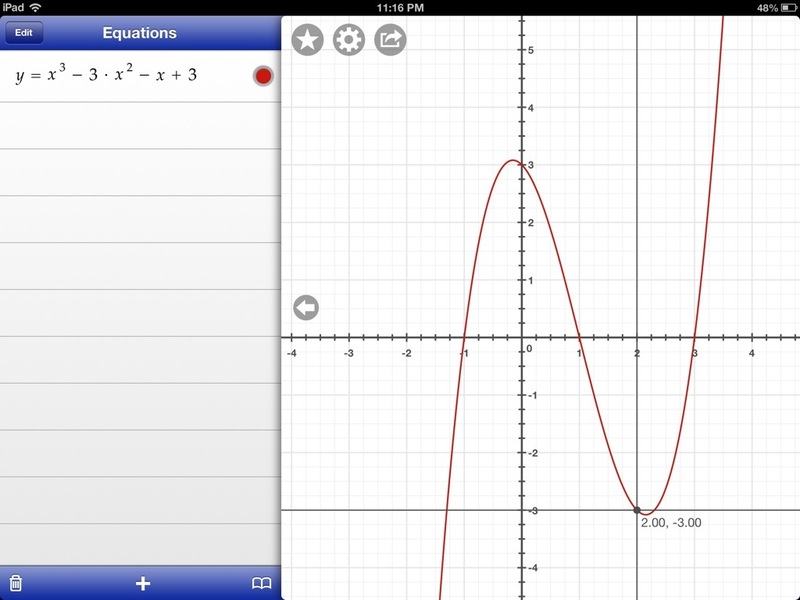 You can use My Grapher to calculate a line tangent to a curve at a given point. Note: In this tutorial, “iPhone” refers to either an iPhone or an iPod touch. 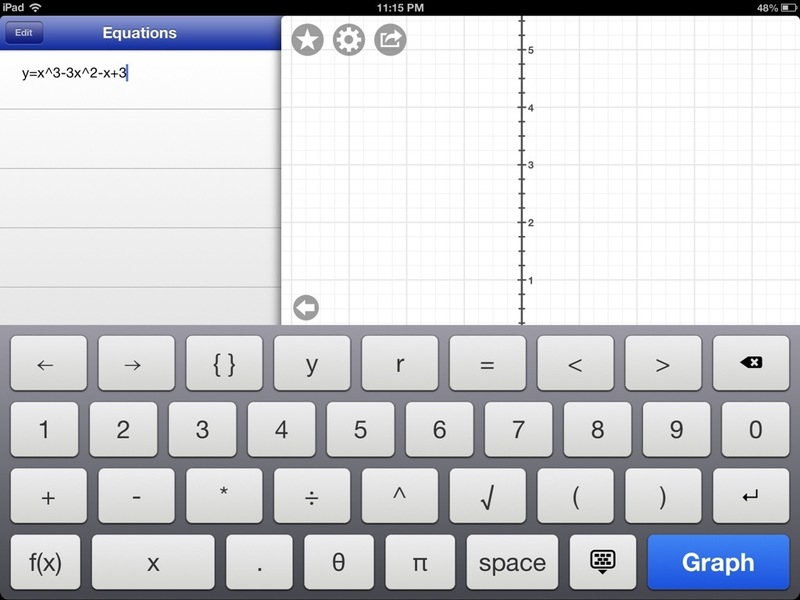 1. iPad: Tap the + button and type in an equation for a curve. 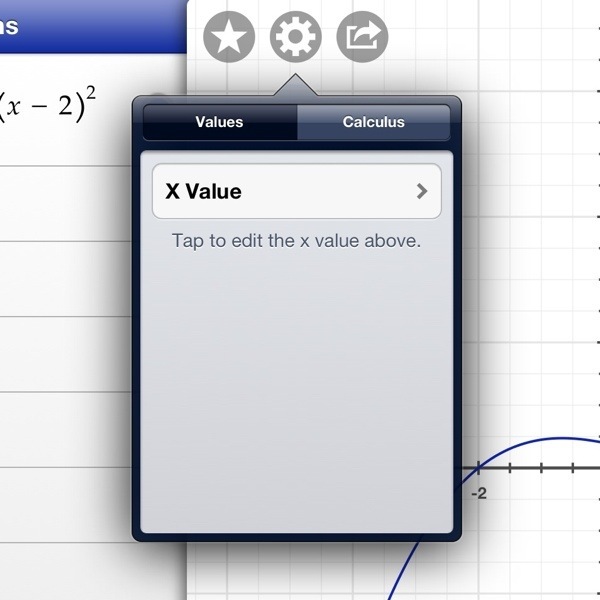 iPhone: Tap the list icon, then tap the + button to type in an equation for a curve. 4. 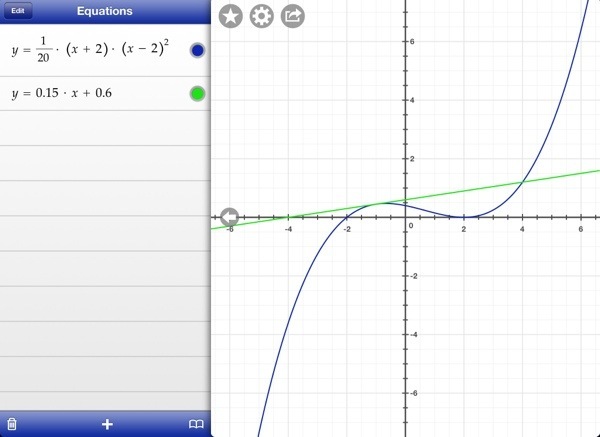 Tap X Value to choose which point the line should be tangent to. On iPhone, type the number in with the number keyboard. 5. 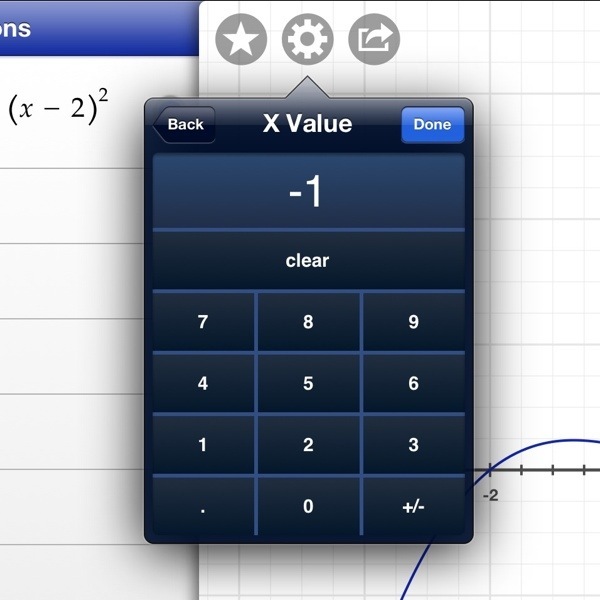 Tap Done, and an equation should appear below the X Value option. 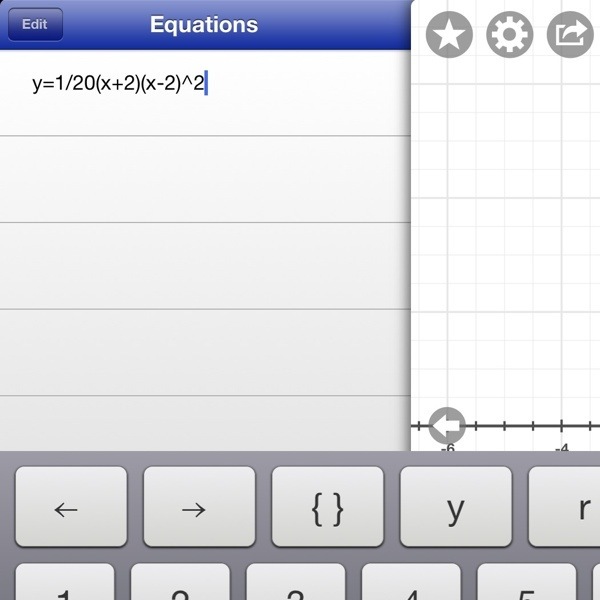 Tap the equation to graph it. I hope this helps you use My Grapher more effectively! Please leave a comment if you have any questions. My Grapher includes powerful tools to help you analyze polynomials. 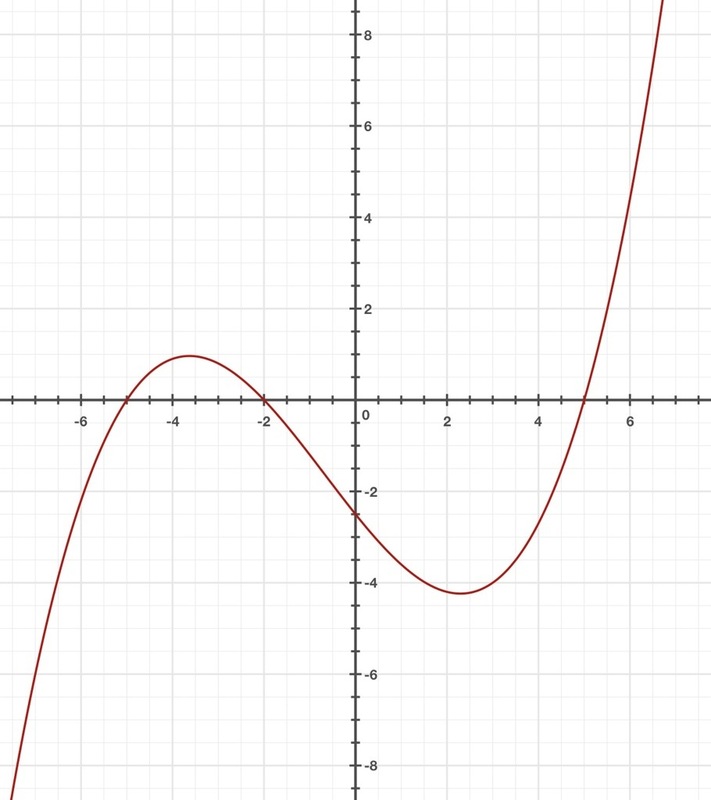 In this tutorial, we’ll enter a polynomial, trace its graph, and find zeros, minima, and maxima. 1. To enter a function in My Grapher, (iPhone) tap the list icon to open the Equation editor. Then tap the + button. 2. Use the function keyboard to enter the polynomial. Powers can be typed using the caret (^) symbol. 3. 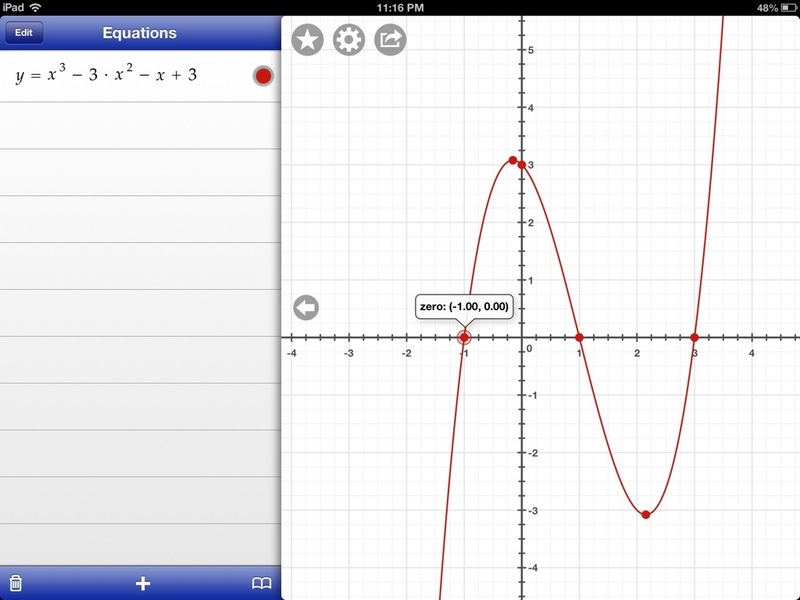 To trace the graph, tap the graph (or tap and hold on iPhone) and choose Trace Mode. Drag your finger across the graph to find the value at that point. 4. Finally, you can get the exact value of a zero or local minimum or maximum. On iPad, tap the gear icon and choose Show Notable Points. 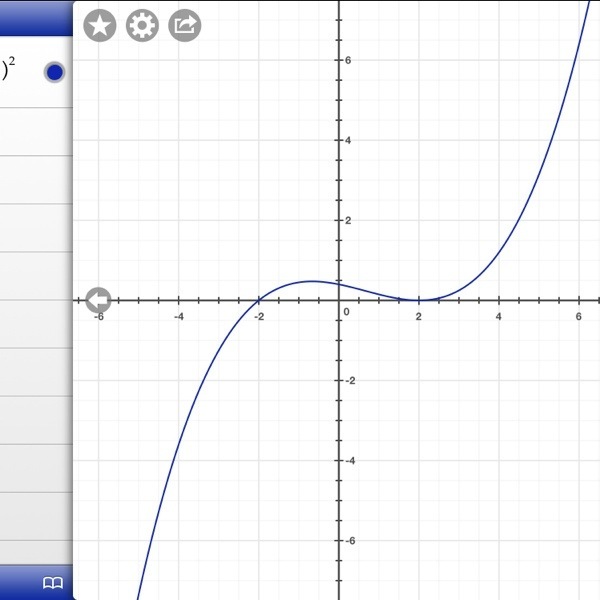 On iPhone, tap and hold the graph and choose Points. Dots will appear on the graph showing the notable points. Tap one to view its coordinates. Last time, we looked at end behavior and nested exponents. 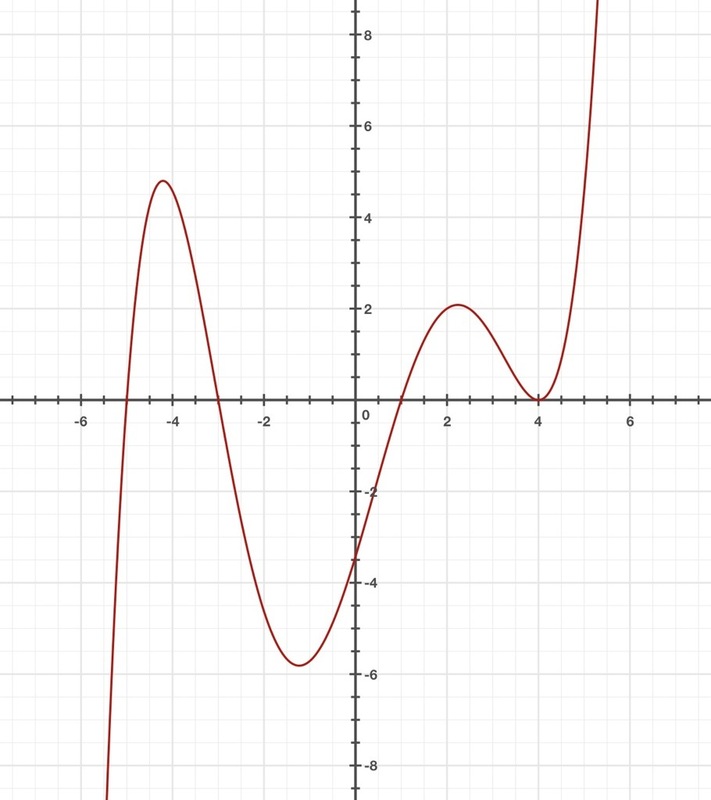 Now we’ll explore a method for sketching a graph of a polynomial. The x-intercepts are -5, -2, and 5: exactly one for each factor (excluding the 1/20, which I add to make the whole graph visible). You can get the x-intercept by setting each factor equal to zero. It’s logical that if there are three factors, there will be three roots and the function will be cubic. 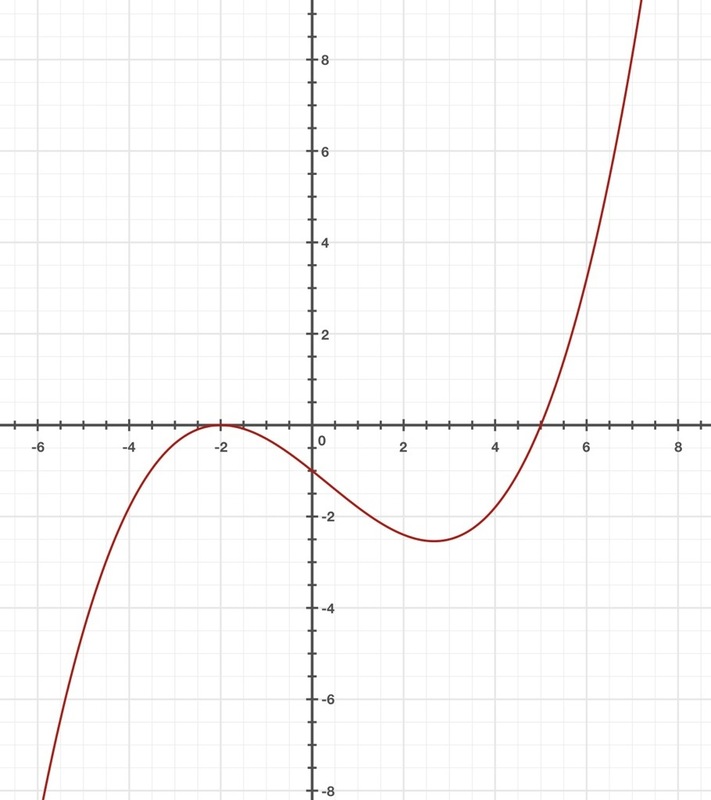 Notice the parabolic shape near x = 4. How can we explain this behavior? Let’s look back at the factored equation which gave us this graph. We can imagine each factor as a hand pulling the graph in different directions. The interactions (product) of the individual pulls creates the value at a given point on the graph. When one factor becomes zero, its “hand” pulls the graph so completely that no matter how large the product of the other factors, the final value will be 0. The factor has a unique pull on the value of the function. As x approaches 4 from either direction, (x-4) approaches 0. Think about a value for x that is really close to 4 – that is, the difference in x is infinitesimally small. Then the value of (x-4) is also infinitesimally small, and squaring that makes an even smaller number! This is quite a small number indeed, and it exhibits its control of the graph by bringing it down close to zero. As for the parabolic shape, this can be explained in a somewhat similar manner. As (x-4) approaches zero, the product of the other numbers has a specific sign: positive or negative. The is always positive, being a square; therefore, it cannot change the sign of the final value. So when it hits zero, it rebounds off the x-axis and remains positive. Next time, we’ll discover what happens when a factor is cubed!